Three ways to observe this day of remembrance. Memorial Day is for honoring military service members who have died in the line of duty. Many communities commemorate the day with parades and speeches. Individually, there are many ways to observe the day, too. Here are three ways you can honor fallen heroes today. You’ve seen veterans outside stores distributing red poppies but do you know why? For over 95 years, the Veterans of Foreign Wars (VFW) have been making and handing out “Buddy Poppies.” In John McCrae’s poem, In Flanders Fields, poppies mark the place of those who “loved and were loved” and died on the battlefield in 1915. The VFW chose the red poppy as a symbol of lives sacrificed in war and the hope that none died in vain. When you donate to the Buddy Poppy program, your gift helps provide much needed services for disabled veterans, as well as their widows and orphans. Meet the veterans behind the Buddy Poppy in this video. Displaying flags from sunrise to sunset is customary. However, the flag may be displayed 24 hours a day if properly illuminated. The flag should never be allowed to touch anything beneath it, such as the ground, water or the floor. No other flag or pennant should be placed above the U.S. flag. If another flag or pennant is at the same level, it should be to the right of the U.S. flag. On Memorial Day, fly the flag at half-staff until noon. At 12 p.m., fully raise the flag. 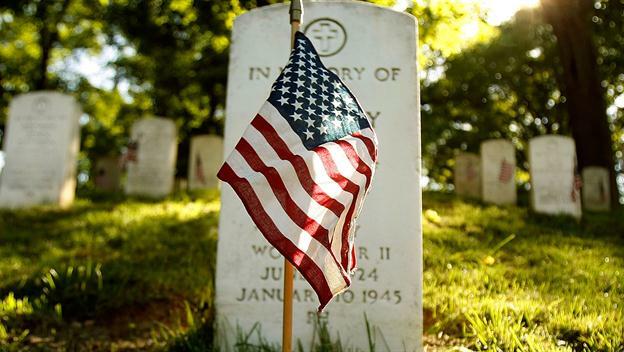 This three-day weekend is traditionally the start of summer, but don’t let the festivities overshadow the true meaning of Memorial Day. Take just one minute to participate in the National Moment of Remembrance at 3 p.m. Congress passed an act in 2000 to establish this moment of silence and honor. Collectively, we should stop everything we’re doing and remember that the freedom we enjoy today was made possible by those who died in service for their country. On this Memorial Day, those who gave their all will never be forgotten!